Do you have some creative idea and you just looking for ways to easily prototype it? Would you be excited to monitor and control the physical world with a software program that you created? Would you like to join the growing worldwide wave of Internet of Things Makers? If the answer is “YES” for most of the questions above then you just landed in the right place. 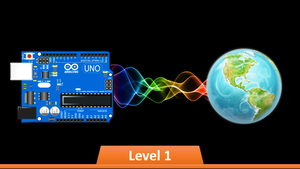 Arduino is probably one of the most amazing developments and prototyping platform today with endless possibilities for Do-It-Yourself Makers looking for ways to express their creative mind and technical capabilities. This course is a starting point as part of a larger comprehensive training program divided into levels that are all about Arduino and the eco-system around it. Each course covers a specific group of subjects to let you develop and grow your skills in a step-by-step pace while enjoying the long journey. Running Our First Program ! Variables Declaration - Why ? What did we covered so far ? What Next ? Level 2 !